Tarukino, LLC a cannabis industry-focused, incubator, introduces Pearl2O™, the world's first and only cannabis-infused water with NO sugar, calories, weed taste or smell virtually NO limits on how you can use it. The Pearl2O™ proprietary water-based cannabis emulsion, maintains potency when cooked, chilled or frozen, launched today in Washington State. Inspired by medical cannabis patients wanting products free of weed taste and properly and accurately dosed THC/CBD servings Pearl2O™ is an industry leader. Pearl2O™ has a 1 to 1 ratio of THC to CBD. 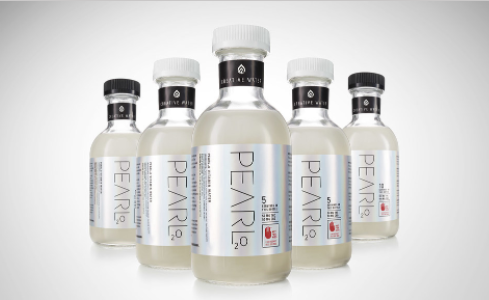 "The challenge of understanding what the dosage per bite or per sip with an edible is now solved with Pearl2O™. This technology platform is used successfully in other products where dosing is important such as Velvet Swing, a sexual enhancement lube with 100mg and Happy Apple an apple drink with 10mg." "I enjoy creating interesting palatable meals for the medical cannabis patient. Pearl2O™ eliminates the weed taste!" Pearl2O™'s innovation speaks directly in support of current legislative efforts on behalf of medical cannabis patients. The therapeutic validity of the medical cannabis community was recently given a bi-partisan vote of support by Senators Cory Booker (D-NJ), Rand Paul (R-KY) and Kirsten Gillibrand (D-NY) who stood with patients, families and advocates in their announcement of new legislation that will allow the use of medical marijuana in states where it is legal without fear of federal prosecution. "I learned about cannabis edibles from my Mom's 70ish year old friends as she battled cancer, the chemo and radiation debilitated her sense of taste. Her friend's took great care to not "bring your mom any of that weedy-tasting crap" shared a marketing executive. Pearl2O™ expands the medical cannabis industry giving them a new vehicle to incorporate cannabis into existing and future products and revolutionizes the recreational cannabis market by empowering the recreational cannabis industry with the ability to deliver more compelling offerings. Pearl2O™ allows retailers to offer consumers a product that lets them incorporate cannabis into almost anything they enjoy. Pearl2O™ frees consumers to make cannabis infused barbecue sauce or ice cubes! Tarukino is an investment and incubation entity focused on premium cannabis-focused, products, goods and services organization. The entity supports a portfolio of ventures staffed by an expert corps of seasoned and vibrant executives, scientists, marketers, sales, and logistics professionals, who are dedicated to excellence and artisanal product delivery. The team hails from the world of Tech, Ad-Agency, Food and Material Sciences, Media, Marketing and Lean Logistics companies and partnerships. The resulting collection of outstanding brands, programming and consumer experiences arm the family of companies with a unique product mix that is attractive to OEM, B2B and B2C/retail marketplaces.